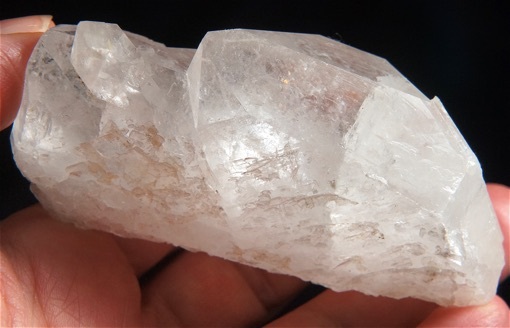 This is a 4.3 oz, 3.2” by 1.6” by 1.1” DT Arkansas quartz from the Sweet Surrender Mine … and is actually a triplet with one termination also bearing a stargazer student. There are Lemurian lines on her sides (and a sparse druse of tiny students on one) and just a touch of clarity at her upper terminations; the lower one has healed into glittering, tiny terminations. The rest of her is entirely mist-filled and the light fills her amazingly … she is a study in the power of healing! Shards are pieces of crystals literally separated from a larger one by Earth forces. Through the eons, these have healed magnificently into intact crystals and are wonderful healers as a result. And she has a scattering of small students with rainbows between her and them! She is very amazing and would be a real treasure for a Keeper who is also a Healer! Shards are the ultimate healers! This Spirit truly wants to be part of a healing practice – crystal healing or Reiki where she can assist both the patient and the practitioner in addressing the true nature of the illness. She helps to strip away the underlying causes, leaving the patient open to the repair to follow. In this manner, she stimulates a real healing, not just a ‘fixing’ of the symptoms. She allows the patient to transmute the negative energies caused by illness into positive ones for growth and healing. I used her in my crystal healing practice in New Mexico about 20 years ago and she has languished ever since … she truly wants to work in healing again and looks forward to her new Healer Keeper.